The original lipid hypothesis stated, more or less, that lowering blood cholesterol would reduce premature mortality from heart disease. At the time, it was thought that dietary cholesterol and saturated fat increased the ‘bad’ type of blood cholesterol, so the advice was to restrict those foods. All of that was wrong. In the revised version, it’s not total cholesterol, but rather the lipoprotein particle size and number that might matter. At any given total level of cholesterol in the blood, the cholesterol can be found in a small number of big lipoproteins or a big number of small lipoproteins (it’s more like a spectrum)… and it seems like the former is the more favorable scenario. 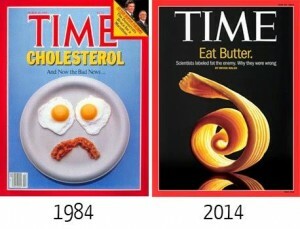 The original lipid hypothesis was wrong about the impact of butter and eggs on cholesterol and CVD, but it may be right about their impact on lipoproteins… and it appears to be in the opposite direction predicted by the original hypothesis. That is, eating a diet rich in saturated fat and cholesterol, and low in carbohydrates, is associated with fewer and larger LDL particles. Could history be repeating itself? We know particle size and number is associated with disease risk, and we know diet can influence these characteristics. Is it safe to assume lipoproteins that have been intentionally manipulated via diet carry the same risk associations as those naturally occurring? Are they causal? Here’s where diet and lifestyle may come into play. Obesity is associated with a higher number of smaller LDL particles (eg, “Pattern B,” Chandra and Rohatgi, 2014), and increased risk of premature mortality (www.google.com). The Chandra study also showed it may be possible to increase HDL-P with exercise. Klempel and Varady showed, among other things, that alternate day fasting (ADF)-induced weight loss was associated with increased average LDL particle size, due primarily to a reduction in the number of smaller LDL particles (Klempel et al., 2013). The intermittent fasting protocol used was 25% intake on day 1, 125% on day 2, repeat. Confounded by weight loss? Perhaps. What’s not “PUFA and n-6 dietary fat?” Saturated fat. 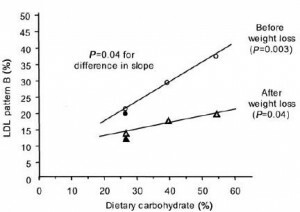 What’s not high “glycemic index?” Low carb. 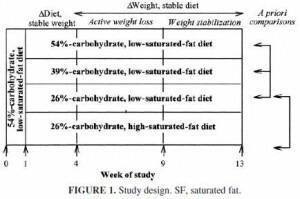 In this study, the ‘separate effect’ of saturated fat was a further shift toward Pattern A.
LeCheminant and colleagues (2010) showed something similar, comparing low carb vs. low fat: significantly increased “Mean LDL Size” in the low carb group after 9 months. 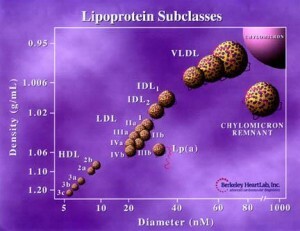 The number of smaller LDL particles increased, albeit statistically non-significantly, in the low fat group. Mean LDL Size, or particle diameter, reflects both particle size and number; increased ‘Mean LDL Size’ can be due to a decrease in the number of smaller particles or an increase in the number of larger particles. Ron Krauss’s group at it again in 2010, showed, among other things, after 9 weeks, oxidized LDL increased and the LDL particles shifted toward Pattern B in people following a low fat compared to a low carb diet (Faghihnia et al., 2010). 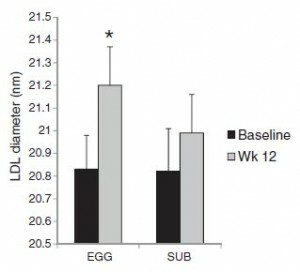 In 2013, Blesso and colleagues showed that a diet containing eggs significantly increased mean LDL diameter compared to one containing yolk-free egg substitutes… the egg group was receiving over 500 mg more cholesterol per day than the egg substitute group (fyi, this had no effect on total cholesterol levels)… and all other parameters, HDL-C, triacylglycerols, insulin sensitivity, etc., all exhibited greater improvements after 12 weeks of eating whole eggs (in the context of a moderately-reduced carb diet, which was similar in both groups), despite similar weight loss. Thus, it could be said that the reductions in caloric and carbohydrate intakes mediated the weight loss, but the added intakes of saturated fat, cholesterol, and possibly choline in the EGG group resulted in lipoprotein improvements. CIMT, coronary stenosis, and atherosclerotic progression are more meaningful measurements/outcomes than changes in lipoprotein size and number. They are associations in this case, no doubt, but potentially very important ones. And now time for the big disclaimer: is history repeating itself? As with the original lipid hypothesis, the links between particle composition and disease outcomes are correlations. The links between diet and particle composition appear causal, in this case, but it’s hard to say, at this point, if they’ll also be associated (causally) with reduced disease risk. If so, is it due to the lipoprotein particles themselves? or due to some other diet-induced change, like in insulin sensitivity, inflammation, stability of lipid membranes, etc. This entry was posted in Advanced nutrition, chocolate, diet, Dietary fat, empty calories, Exercise, fat, insulin, Protein, Sugar and tagged Atkins, body composition, calories proper, carbs, chocolate, diabetes, diet, empty calories, energy balance, fat, insulin, ketogenic, ketosis, nutrition, obesity, Paleo, protein, sugar, trans fat. Bookmark the permalink.